Most cities, towns and single and multi family developments have water supply and sewer treatment plants. If you are in a community with a sewer treatment plant you may have a "tap on" fee for the disposal of the water and sewer waste from your home. If you are in a suburban or rural location, you may be required to install a well and a septic system. Your Realtor will explain much of the information below to you. Though a good deal of the information below is above average technical information for a Health Department, Building or Licensed Septic Professional, it can be useful for the average home owner or a home owner with questions and concerns regarding their existing or future septic system. A "Site Evaluation" is often sufficient to close on a piece of property. A "Septic Permit," above and beyond the "Site Evaluation," will be required in order to "Pull a Building Permit." It is important to know that you cannot "Pull a Building Permit" without 1) a well permit and 2) a septic permit. The permitting of these two systems makes sure they are platted and located the appropriate distance from each other and they are not run over by a driveway or too close to your home. A site plan is recommended for locating your preferred well and septic tank locations. The County Health Department issues "Septic Permits" based upon a "Site Evaluation" and often this requires a number of visits to the site, a survey that locates the septic "field" on the "site plan" and "test holes" being dug to evaluate the ability of the soil to process the waste effluent (a "perc" test). Occasionally a given lot or other property may not accommodate a septic drain field and the "Site Evaluation" by the Health Department will require a "deeded location on an adjoining piece of property" to install the septic tank and/or drain field. Home owners should anticipate additional survey and builder time expense to make sure their drain field is located according to the "Site Plan" and the deed. The outline below or the scope of this information does not address the fact that many systems installed over the years are not up to the standard of today's Health Department requirements. It does note the importance of periodically "pumping" your tank to remove solids and liquids in order to make sure that the solids do not enter your drain field and cause a drain field failure. If your drain field fails, a new drain field will need to be installed. This can be logistically complicated and expensive. If you are buying an existing home, we recommend having your tank and drain field inspected by a professional as a part of your due diligence. Septic systems can be one of the most overlooked systems for homeowners and potential clients when purchasing or building a new home. Depending on where you lived in the past, you may have always relied on local infrastructure to provide your waste services. But in many parts of the country, homeowners must provide their own means for disposing of wastewater via septic system. Septic systems are regulated by local government (usually county) due to environmental concerns, and lack of awareness by homeowners. Before the county will even consider issuing a building permit where local waste treatment infrastructure is not provided, a septic permit must be issued by your local health department. Most common septic systems are composed of four components, a sewage pipe that carries wastewater from the home to the tank, a septic tank where waste is stored, a drain field (leach field), and soil. In newer septic systems, a fifth component called a distribution box can be found between the septic tank and drain field that equally distributes effluent throughout the drain field. 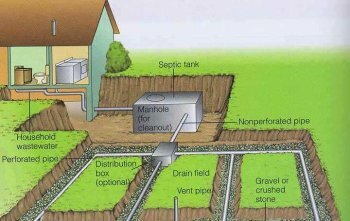 Septic tanks are large, sealed, waterproof containers usually made of concrete, fiberglass, or polyethylene that is buried outside the home. As wastewater is stored in the tank, liquids and solids are separated. Solids settle at the bottom of the tank forming sludge, while lighter solids and grease (scum) float to the top, allowing only the liquid effluent to enter the drain field. . This is a very important function of the septic tank, because this occurrence prevents solids and grease from clogging the drain field, which can cause backups that can get very expensive for the homeowner. While the wastewater is stored in the tank, naturally occurring bacteria and microorganisms help breakdown the waste, which is essential to the purification process. This is why pouring household cleaners/disinfectants that kill these naturally occurring bacteria and microorganisms can cause serious harm to the function of your septic system. The bacteria also breaks down remaining sludge and scum that can reduce the actual volume of content by up to 40%, which eventually settles at the bottom of the tank to later be extracted. The tank will need to be pumped periodically to remove the accumulated sludge. How often you will need to pump your tank, will be dependent on the number of occupants in the household, size of the tank, and soil type. We suggest that every homeowner with a septic system consult a professional regarding the recommended pumping schedule. We recommend to our clients, depending on location of the site and number of occupants in the home, that tanks be pumped every one to three years. For instance, sites located near creeks, rivers, and lakes will require more frequent pumping. Also tanks located in colder climates require more frequent pumping than tanks located in warmer climates. When we install septic tanks during the initial phase of construction, we also install "risers" or tank lids, so the tank is easily located and accessible for future pumping. As the liquid effluent exits the tank, the liquid waste is usually gravity fed through a pipe into a drain field. In some cases, depending on site, the waste will need to be pumped uphill into the drain field. Some newer septic systems will apply a distribution box at this point in the system that allows an equal distribution of liquid effluent among the drain field for better absorption of the soil. A drain field usually consists of several trenches filled with gravel or open chambers that contain perforated piping that distributes the waste. If too much liquid waste enters the drain field, effluent can rise to the surface causing unpleasant odors and environmental health hazards. Properly sized septic systems and quality installation by professionals can prevent disruptions in the function of the system. The soil type is very important in proper drainage of the field and remaining purification of liquid effluent released in the drain field. Soil type also dictates the size of the drain field, which directly affects the cost of the system. Coarse soils like large grain sands and dirt provide better drainage qualities than fine grain soils, like clays and silts that hinder the drainage capacities of the soil. Less drainage properties found in the soil type results in larger drain fields. The soil also provides the final purification before reaching the groundwater beneath the water table. Poor soils lack the bacteria and microorganisms needed for this final purification process. Mountain Construction does custom home building in any building style, including conventional new homes, remodeling and restorations, log homes and timber frame homes and structural insulated panel homes. Check out our site and learn more about our Construction and Remodeling services.